TRENDS are sprouting all over the internet and garden trends are going to be featured here over the next while. But first, here’s what my formerly pleasant street street now looks like. 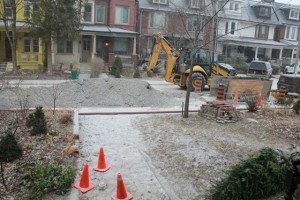 They are changing the 1880s sewer and water pipes and it’s like living in the ninth level of purgatory: blinking lights from 7 am to any time they feel like quitting at night; beep, beep, beep and the awfulness of Toronto clay walked into the house smothering carpets and shoes. The Saturday before Christmas a group of lads showed up late in the afternoon. They got the gigantic earth movers going and then drove them off rather quickly I thought as I turned back to work. When the cop arrived on Monday he asked: “Did you notice anything odd over the weekend?” Of course I had, at 4:35 on Saturday two giant machines left the site. “What did the guys look like?” he asked. Well, like construction workers: puffy vests, toques, steel-toed boots. “Where are the machines now?” I enquired. Oh, on a ship to a foreign land; or off to another construction site. The contractors were convinced it was organized crime. It certainly looked organized but it’s hard to feel sorry for them. Apparently all Caterpillar machines have the same key. All you need is one bent person and you’ve got yourself a $120,000 chunk of metal. Trends come slowly to the mind when this sort of annoying stuff is going on. But I’m as willing as the next person to take a shot at it. We used to joke at Gardening Life magazine that whatever we declared as a trend one year, we’d say was out of style the next. Not completely true but now there are so few garden mags, I still like this pretentious little ritual–it makes us all feel like the season is about to swing over into something new. 1. Vegetable gardening in the front yard or among the perennials is going to be as big this year as it was last. People have fallen in love with growing vegetables, not just for eating but also for the aesthetics. A gigantic fennel or edging of Swiss chard looks great among autumn bloomers such as Salvia bonariensis and other plants of its ilk. 2. Orange has been declared the colour of the year by the fashionistas, and gardeners have been ahead of the curve on this one. We chose orange tulips, dahlias and echinaceas to marry up with purple and magenta plants a few years ago. This year, we’re trendy. 3. Fewer lazy landscaper gardens: you know the kind–thirty hydrangeas, 18 grasses et voila a Piet Oudolph garden. Well, not bloody likely. Oudolph is a genius at colour block planting and I haven’t seen one garden in this style that passes muster. This sort of dreary garden is so foolproof and so boring that even the most visually illiterate of clients wants it to be replaced by something requiring both thought and individuality. Most of our work last year at Marjorie Harris Gardens was taking out this sort of egregious mess, moving plants around and adding new and exciting ones. 4. Flowering shrubs. Instead of putting in tall perennials, smaller flowering shrubs are catching the eye of gardeners. There are some staggering beauties coming into the market place and it’s a matter of demanding them at your own favourite nursery. There are such dishy ones as my favourite plant du jour: Calycanthus floridus an eastern native with maroon blossoms and long tapered leaves. I’ll have a list and pix of the new ones I adore coming up shortly. More trends to come, I hate these blogs when they get too long. I also apologize for having been absent such a long time but between our tour to Italy last autumn and recovering from knee replacement surgery immediately after, I seem to have been totally preoccupied. I’ll keep this up on a regular basis from now on. And I’ll be sending out the free midwinter newsletter next week. If you’d like to receive it and are not on the mailing list, just get in touch. And we’ve got the new itinerary for this year’s trip to Italy just hit the button up on the banner and you’ll find it in all its glory. I was thrilled that you are back at it. Thanks for sending the newsletter. I also stopped by your website and enjoyed reading your blog on the 2012 trends. I was not aware that you had knee replacement surgery, but I’m glad to hear your feeling better! Thanks so much Lorraine. What a difference in my life. I will soon be able to walk everywhere without a cane or pain. New book coming in March but I’ll take sure you know about it. How nice to here from you. I think your trends are right on the money! Always hug a tree, reward yourself with edible plants, I love it! Also, the lazy landscape slayed me cuz I have seen some of these recently. As one contractor becomes more prevailant in our area I can spot their work. In my own defence I work with a lot of Hydrangea, but you won’t see them in a row! As our microclimates inch higher( numerically) more compact shrubs become available. I like the winter aspect of shrubs, and ease of mait. Thanks for the new e-letter, and a speedy recovery! I love hydrangeas and keep trying new ones and find many so superior to the ones the landscapers use endlessly. I hate seeing a plant overused to the point of becoming boring: boring gardeners do that sort of thing.